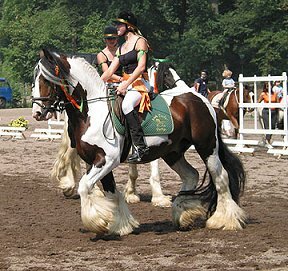 Sligo is a famous stallion from Germany. He is registered, licensed and proven in three German stud books. He was born in 1995 in Ireland and is a traditional old Irish type. He has tons of feathers, and lovely markings. Sligo has been on stud since 1997, and he is the father of five licensed and proven sons, three gold medal foals, and two state premium mares. He is trained in dressage and driving as well as small jumps. He is honest and strong in any situation, and he handles himself as a real gentleman. Anyone would have an easy time riding and handling him. Sligo's proud new owners are Jeff and Deborah Gakstatter in Bend, Oregon.